I hold American Red Cross instructor certifications to teach these courses: Basic Water Rescue; First Aid; Water Safety; Lifeguard Training; Waterfront Lifeguard; Shallow Water Lifeguard; Lifeguard Management; Oxygen Administration; Bloodborne Pathogens: Preventing Disease Transmission; First Aid for Public Safety Personnel (Title 22); Disaster Preparation; Safety Training for Swim Coaches; Epinephine Auto Injector training; asthma inhaler training; Infant, Child and Adult Cardiopulmonary Resuscitation and Automated External Defibrillation (CPR/AED); and CPR/AED for Professional Rescuers and Health Care Providers. I hold Red Cross certifications to train Lifeguard Instructors, Water Safety Instructors, CPR/AED Instructors, and First Aid Instructors. I have mentored two Instructor Trainers. I have been a lifeguard, lifeguard captain or lifeguard captain and in charge of the swim, at 53 triathlons or open water swims, (and my lifeguard training graduates have joined me for many of the following), including the Danskin Women’s Triathlon (6 years), National Triathlon for the Physically Limited (4 years), Bud Light (4 years), All For Kids Day (2 years), San Jose International (2 years) and the 25th Anniversary Far West Games (1992). My husband and I were lifeguard/swimmer escorts for a “Pier to Pier” 6 1/2 mile swim from Capitola to Cowell’s beach in Santa Cruz in 1998. In 2000 through 2013 De Anza College-trained lifeguards volunteered at the Escape from Alcatraz ‘Sharkfest’ swim (and/or the the Alcatri triathlon) from Alcatraz to Aquatic Park in San Francisco, and/or the Golden Gate Bridge Sharkfest swim from the south tower of the bridge to Sausalito. In 2009 we guarded the summer National Senior Games Triathlon when it was held in the S.F. bay area. 2004 through 2014 we guarded (and I was lifeguard captain for) the Silicon Valley Kids Triathlon. In 2017 we guarded the Escape from Alcatraz again. And we guarded the California State Community College Swimming and Diving championships held at De Anza College in May 2018 and the Golden Gate Sharkfest July 22, 2018. I swam competitively in high school and was Sports Editor (as well as Editor-in-Chief and News Editor) of the De Anza newspaper (La Voz) as a student here. 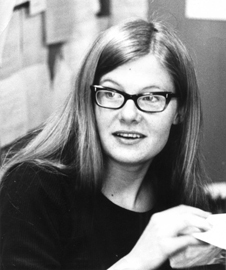 Below: my editor photo at the La Voz (De Anza College student newspaper) office at age 19. I am a graduate of De Anza College, as is my husband who I met at De Anza on the campus newspaper. I was Girl Scout Counselor-in-Training in the Santa Cruz Mountains for two summers, worked at San Jose Family Camp for one summer and as a Girl Scout Camp Counselor in Idaho for two summers. At the camp in Idaho I was half of a team that were champions in blindfolded rowboat racing. Below a typical home for the summer, this one in McCall, Idaho. then in Biological and Health Sciences as well. I am a member of the De Anza College Academic Senate Executive Committee (since 2012). I’ve also taught at various Adult and Community Education centers, City Recreation Departments and have taught other groups as diverse as the staff of the Sunnyvale Senior Center; the staff of James Ranch/Harold Holden Boy’s Ranch (for the County of Santa Clara Probation Department); the Girl Scouts; Saratoga-Los Gatos, Milpitas and Fremont Union High School District staffs; Federal Court staff; De Anza’s Security staff; various corporate wellness centers and trainees for the California Conservation Corps. I’ve taught various subjects as a volunteer at the Silicon Valley Red Cross Chapter, the college, Harker Academy, and the San Tomas Neighborhood Association. After completing Community Emergency Response Team (CERT) training in 2002 I worked as a volunteer at Campbell/Cupertino/Saratoga/Los Gatos/Monte Sereno (CERT) training exercises. In 2003 I became a volunteer trainer (instructor) for Campbell CERT, primarily in Disaster Medicine. In 2004 I became a Red Cross Lifeguard Instructor Trainer (the person who trains lifeguard instructors) and Water Safety Instructor Trainer (the person who trains swimming teachers). I served on the Silicon Valley Red Cross chapter Instructor Trainer Committee. I was given a “2004 Volunteer of the Year” award for CERT work in Campbell from the Santa Clara County Emergency Managers’ Association. In 2005 I earned my FCC element 2 technician class radio license. March 2014 I became a volunteer with Yosemite National Park Preventative Search and Rescue. As Senior Faculty Advisor to the De Anza Outdoor Club since 1990, I’ve led a multitude of camping, snow camping, backpacking, canoeing and kayaking trips. A dozen links to club info start at Outdoor Club Basic Info. 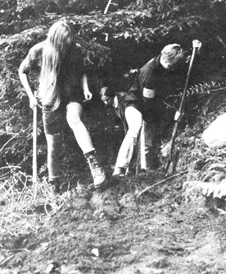 Below, April 1969, a Sierra Club and Sempervirens Fund project, at Big Basin State Park, building the Skyline to the Sea trail (nearly 50 De Anza students participated, including members of the “Los Montaneros Camping and Climbing Club,” the precursor of the Outdoor Club). Left to right, students Mary Donahue, Jo Ann Siebert and Sue Blair. Photo by Judy Shapero. Yes, we cleared and got rashes from poison oak. I am the webmaster for this website. In late October 2006 the original De Anza College version of my faculty website, one of the first faculty websites at De Anza, received its one millionth hit. April, 2008 it received its two millionth hit. In late 2009, the three millionth. In late 2010 it had four million hits, in late 2011 five million. In March 2016 the De Anza server was failing and I moved the faculty website here. It is currently getting one and a half million hits a year. In my spare time I work on the Ultimate fixer-upper. There is no bad weather, just bad clothes. Snow or rain camp must-haves includes this advice: always bring your really good waterproof rain pants and hooded rain jacket (no ponchos). Don’t waste money on cheap tools. You are smarter than the bears, but they jog faster than you can run. Moose swim faster than you can paddle. Bison in the Rocky Mountains are more dangerous than bears, (but this is caused by people). Never turn your back on the ocean and you won’t get caught by rogue or sneaker waves. Never swim alone. Don’t fight any current. Two-thirds of drowning victims are good swimmers. Why you should wear a lifejacket. Swim, bike, boat, ski, skate and drive sober. Wear your helmet! Keep your first aid and CPR skills current. Chocolate is a food group. Start your day with a liter of water. Never hold your breath when you lift. Learn how to say no effectively. It’s never time to give up. You’re never too old to learn. Don’t use a chainsaw indoors. Don’t try to weld a gas tank, even if you are sure it is empty. If your budget comes up short and you think you have to drop out of school, drop back in. Take at least one class every quarter/semester/session, so you stay in the program. From the 2002 U.S. Census Bureau Report we learn that over a period of 40 years, people holding bachelor’s degrees earn 2.1 million dollars. People with a master’s will earn 2.5 million dollars and with a doctorate 3.4 million. Spelling counts. If you can’t write well with proper spelling and grammar it will hold you back in anything you try to do. Put off getting your first tattoo until you have given blood a few times. You probably won’t want to stop giving blood and will opt for the temporary tattoos instead. — Study, manage your money and exercise as if you will live forever. Play as if you will die tomorrow. Has an astronaut’s view of De Anza. The north/south axis is reversed from what you are used to seeing on a map, south is at the top of the page. Steven’s Creek reservoir is the dark blue shape on the right. The main roadways showing are 280 left to right across the page and 85 towards the right side top to bottom. If you look a little closer you can spot Steven’s Creek Blvd and find De Anza at Steven’s Creek and 85. At the site you can become a member of the Yosemite Conservancy and get a discount on books, postcards, etc. at Yosemite visitor centers and most other national parks. Yes, you can quit smoking. Keep trying even if it takes a few tries, it will be worth it. Photo below courtesy of the California Department of Public Health.